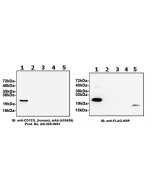 Fc (human):CD137L, Soluble (human) (rec.) (AG-40B-0173) binds to human CD137. 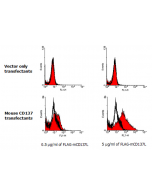 Method: CD137 (human):Fc was coated on an ELISA plate at 1μg/ml. After blocking and washing steps, indicated concentrations of Fc (human):CD137L, Soluble (human) (AG-40B-0173) was added. Following incubation for 1 h at RT, the binding was detected using an anti-human CD137L primary antibody (AG-20A-0031), following with an anti-IgG (mouse) (HRP) secondary antibody. The receptor-binding domain of human CD137L (aa 85-254) is fused at the N-terminus to the Fc portion of human IgG1. Binds to human CD137 receptor. Reconstitute with 100μl sterile water. The CD137 ligand (CD137L; 4-1BBL) is a member of the tumor necrosis factor (TNF) family. CD137L is a type II transmembrane protein found on activated macrophages, dendritic cells and mature B cells. The interaction with its receptor 4-1BB induces recruitment of TNF receptor-associated factor 1 (TRAF1) and TRAF2 and interaction with the kinase p56lck. CD137 and CD137L have been reported to be involved in tumor rejection, apoptosis, anti-viral immunity, diabetes and in T and B cell co-stimulation and modulation of the immune response. anti-CD137L (human), mAb (ANC5D6) ANC-365-020.